Sports bloopers have always been popular – even before YouTube, social media, and other 24/7 outlets, “sports fail” shows always had a large audience. Highlights (or more like lowlights) of a fly ball lost in the lights, a missed slam dunk, or a football player running the wrong way with the ball, watching athletes mess up in the most clutch moments is usually good for a hearty laugh – even if fans of those teams weren’t laughing at the time. But the thing is, sports bloopers aren’t the only time employees fail on the job. Sure, the spotlight is certainly on athletes, but major screw-ups are commonplace every day throughout America. At all sorts of jobs. With industrial-based jobs, bloopers aren’t just bloopers. Not paying attention can result in serious consequences. Sometimes, those incidents are captured in a harmless photo. But other times, they show up in the news as OSHA violations. 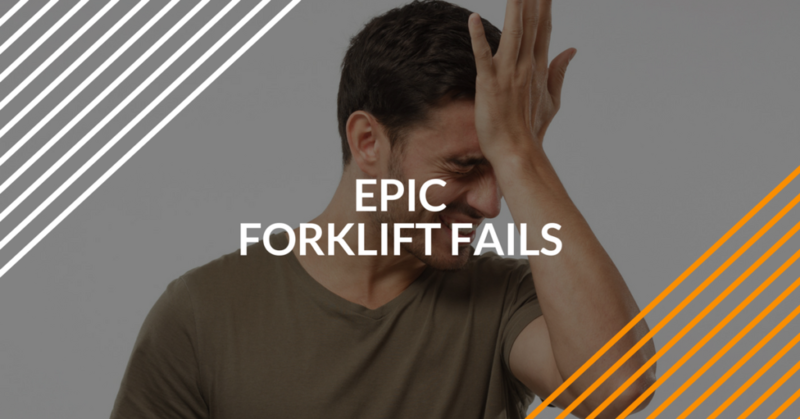 For forklift drivers, there’s seemingly no shortage of pics, videos and other unfavorable media that show epic forklift fails – in fact, here’s one on our Facebook page. While the social media angle certainly grabs everyone’s attention, incidents like these also grab OSHA’s attention. If you’re involved with forklift fails, there’s a very good chance you’ll be subjected to an OSHA inspection, the loss of employment, or legal action. Forklift Fails: Unfortunately, They’re Here to Stay! The OSHA training experts recently scoured the ends of the internet (well, almost) and came up with some of the most bewildering, head-scratching, mind-boggling, OSHA violating, did-he-just-do-that, OMG forklift fails. Check out the video below to see for yourself! Forklift fails. Powered industrial truck incidents. Epic safety oversights. Whatever you call it, one mistake while operating a forklift can spell disaster for you and your co-workers. Don’t become part of the next viral forklift fail photo compilation. Minimize distractions. Keep your speed at a reasonable level. And always pay attention to your load weight. There are just some things you can do to ensure ultimate safety when operating a forklift. Check out our forklift safety tips & tricks for more helpful information. Don’t Become Forklift Fail, Exhibit A – Sign Up with ForkliftCertification.com Today! Forklift accidents happen more often than you think. After all, how else did we come up with so many examples of on-the-job forklift fails? But it doesn’t have to be this way. With OSHA approved training, Forklift Certification has everything you need to operate a powered industrial truck the correct way. The safe way. Each and every time you start a shift. We offer three different training packages to meet and exceed your forklift training needs. Our Train a Trainer, Training Kit and Bundle Package contain tons of useful knowledge, practical applications of important safety concepts, and other training aids to help you become the best forklift driver you can be – and that’s always a great idea if you’re looking to land a secure career as a forklift driver! If you have any questions about our forklift training, visit our contact page, or give our OSHA forklift training consultants a call at (888) 278-8896.